The HBB gene provides instructions for making a protein called beta-globin, which is a subunit of a larger protein called hemoglobin. Beta-globin is located inside red blood cells. Hemoglobin normally consists of four protein subunits: two subunits of beta-globin and two subunits of another protein called alphaglobin. Each of the four protein subunits of hemoglobin carries an iron-containing molecule called heme. Heme molecules are necessary for red blood cells to pick up oxygen in the lungs and deliver it to cells throughout the body. More than 250 mutations in the HBB gene have been found to cause beta thalassemia which is a blood disorder that reduces the production of hemoglobin and sickle cell anemia which causes distorting the red blood cell. HBB gene mutations that decrease beta-globin production result in a type of the condition called beta-plus (B+) thalassemia whereas mutations that prevent cells from producing any beta-globin result in beta-zero (B0) thalassemia. SNP DETECTIVE HBB kit contains 2 primer pairs for amplification targets on the HBB gene. 28 region-specific probes and 56 single-base-specific fluorescence labelled DNA probes are used for detection of SNPs (Single Nucleotide Polymorphisms). The kit uses a five-dye fluorescent system which allows multiplex amplification-ligation in the same tube for automated SNP analysis. 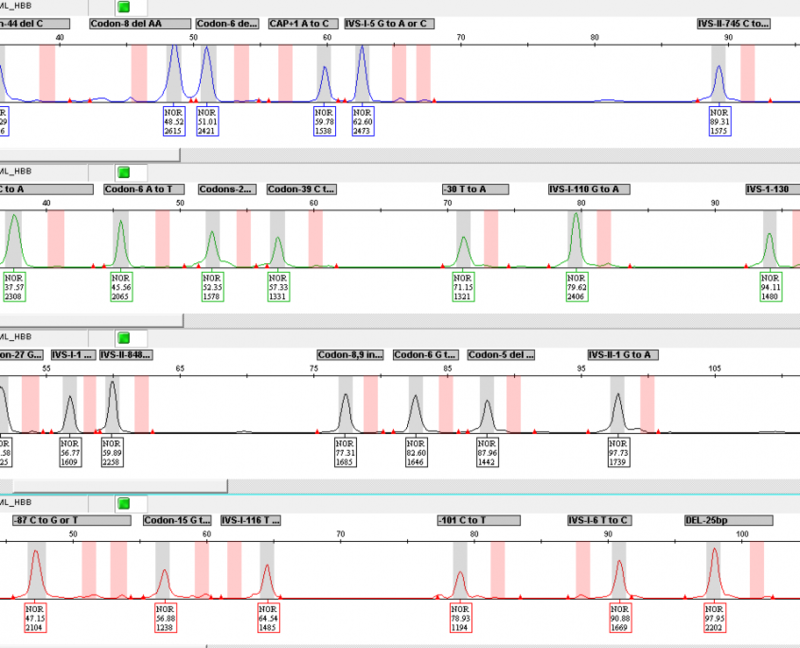 The SNP Detective HBB Kit incorporates an external control with a wild-type pattern for all related mutations to ensure the performance of the ligation reagents and to investigate troubleshooting related with genomic DNA and DNA probes. Advances in capillary electrophoresis platforms and five-dye technology provide high precision and easy analysis. 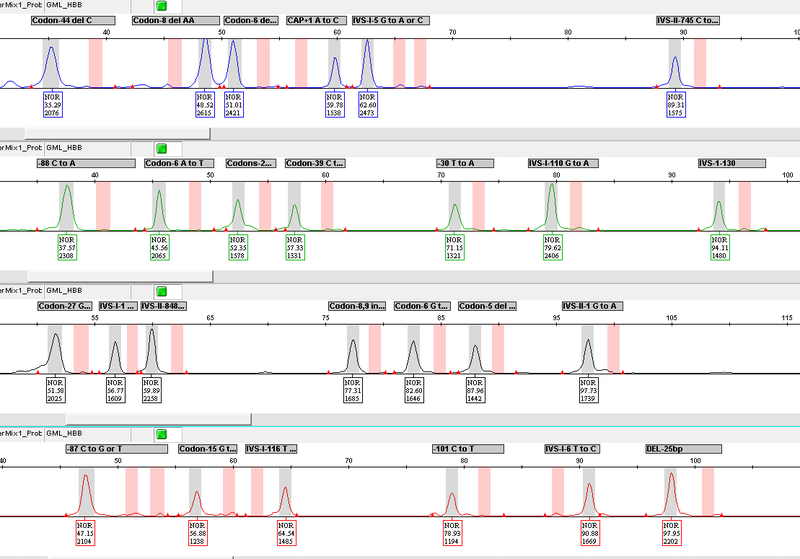 Precise and quick genotyping for all mutations in the same plot screen. Multiple samples can be analyzed in seconds, using GeneMapper® or GeneMarker Software. Please email us for product support requests and include your product LOT number. © 2016 Genomed. All rights reserved.